Hotel booking sites are traditionally the usability black hole of the mobile web. Finding and booking a hotel at the last minute is something every traveler occasionally has to do. The mobile web seems like an ideal way to do this, yet the major booking sites and hotel chains do not seem to have much interest in capturing this enormous opportunity. Most mobile hotel sites appear to be thrown together with no real usability testing or understanding of the unique nature of mobile based data entry. I was pleasantly surprised last month by KeyToss’ well done front end for Hotels.com. It’s relatively easy to use and works on virtually any phone. When I heard that Hyatt and Usablenet have launched a new mobile site for Hyatt Hotels and Resorts I was hoping that it would continue the trend toward better hotel sites. Hyatt got some things right but there is still a lot more friction than necessary in the booking process. There are some nice features on the site. A neat thing I haven’t seen before on a mobile hotel site is the ability to check in or out online. You can also search for, view and cancel existing reservations. Both these functions are well designed and require a minimum of data entry, just your reservation number and name. Members of Hyatt’s Gold Passport loyalty program can check their account details and reward points balance. It’s even possible to enroll in Gold Passport on the mobile site. To me the most important feature of a mobile hotel site is the ability to find and book a hotel room on the road quickly and with a minimum of hassle. The Hyatt site gets the job done but there are some rough spots in the process. The initial search is by location only. A single free-form search box handles city names and abbreviations, airport codes and landmarks so “San Francisco”, “NYC”, “Paris”, “CDG”, “Fisherman’s Wharf” and “Beijing” all work. However, the site doesn’t seem to understand postal codes, full street addresses or a combination of a landmark and city like “Central Park, NYC”. The search defaults to all Hyatt owned properties (Hyatt Hotels & Resorts, Hyatt Place, Summerfield Suites, Hyatt Vacation Club and Andaz) but there is a dropdown allowing you to restrict the search to any single family of hotels. The results of a search are all the hotels within 50 miles of the specified location listed in order of distance. Because the initial search form doesn’t allow specifying dates, the list may include hotels which have no vacancies. It’s necessary to click a “Check Rates and Availability” button under each individual hotel listing to see if that property has a vacancy. To Hyatt’s credit, the site does remember the dates you entered on the first hotel so that you don’t have to reenter them for each one. But a better design would be to allow dates to be entered on the initial search form along with the location. That way the results could include only hotels with availability as well as make it possible to include the price of the least expensive available room in the initial listing. Booking a room is typically the most problem ridden area on hotel sites. The root of the problem is the requirement of hotels (at least in the U.S.) for full credit card information at time of booking, which in turn means completing an endless form. The Hyatt site is no exception with no less than ten fields required to make a reservation. There doesn’t seem to be any way to store credit card details with Hyatt for future use. Even Gold Passport members don’t appear to get a break here. Surely the Hyatt already has their loyalty club member’s information on file. Why not let them make a reservation with just their Gold Passport number and password? I have to wonder why credit card companies haven’t implemented a mobile PIN system like PayPal and Google Checkout use. It’s so much easier to make purchases with PayPal or Checkout on mobile sites with just your phone number and a PIN. For that matter, why don’t hotels accept PayPal? 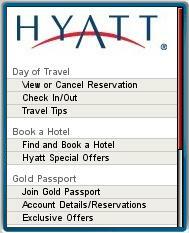 Unless you have a QWERTY phone, I don’t think it’s practical to book a room online with the Hyatt mobile site. 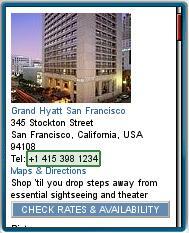 Thankfully, Hyatt provides click to call local numbers for each hotel. The sensible thing to do is to use the site to check availability and prices and then call the hotel to complete the reservation. I’m not sure if the online prices will be honored when making a phone reservation, however. The Hyatt site has pages as large as 89 KB of text and images. This is too big to load on many embedded feature phone browsers. This means that the site will not work on over half the web enabled phones in use today. This is sort of the mobile equivalent of IE-only desktop sites. There’s really no reason a site of this type can’t work on all phones. Surely Hyatt has the resources to build a site that uses browser detection and adaptation to limit page and image sizes to device capabilities. It reflects badly on the brand when users go to Hyatt.com with their phone and then, often after spending some time entering data, receive an error because the page is too large. This entry was posted in Hotels and tagged booking, Hotels, Hyatt, mobile site review, mobile usability, Usablrnet by Dennis Bournique. Bookmark the permalink.